Harbor Terrace is located on the ground floor on the east side of the main Aquarium building. Overlooking Rainbow Harbor with a view of Shoreline Village, this outdoor space features tables and seating for visitors wishing to take a break, in addition to two popular exhibits: the Moon Jelly Touch Lab and an exhibit featuring two species of amphibious mudskippers. Harbor Terrace can be accessed through the Aquarium’s Pacific Collections gift store or by following the walkway past Lorikeet Forest. 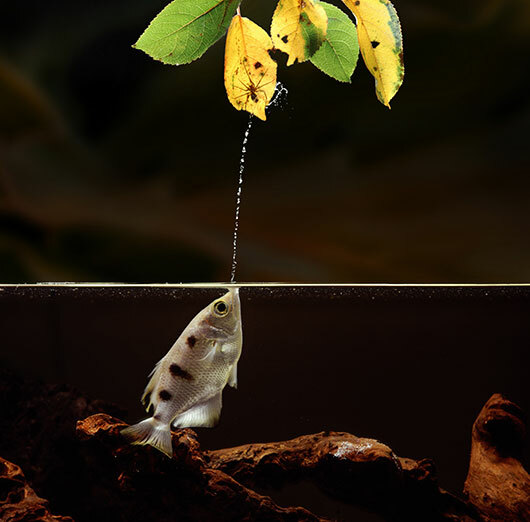 Archerfish have the ability to spit a jet of water above the surface as a method of hunting insects and other prey. They can target their prey on the water’s surface or even in low-hanging branches. They typically are found in mangroves and estuaries from India to the Philippines, Australia, and Polynesia.​ This fish grows to about 4 inches in length and has a silver body with four or five black vertical stripes. Aquarium visitors will be able to witness the archerfish’s hunting prowess during daily feedings. 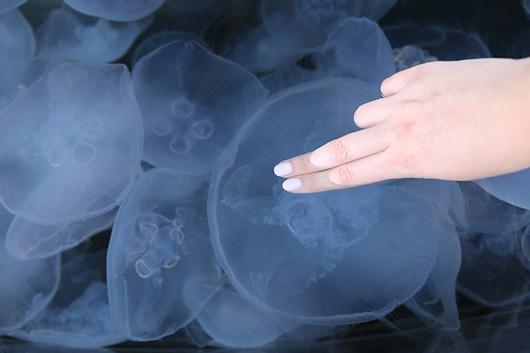 The Moon Jelly Touch Lab is a very popular stop, with a large curved tank that can accommodate the many Aquarium visitors who wish to touch these gelatinous creatures. It is staffed by members of the education department, who can point out the anatomical features of moon jellies and answer questions about what they eat, how they reproduce, and other jelly facts. The translucent moon jelly can be identified by the four half-circles on its bell. These are the reproductive tissues. The toxins in this jelly’s stinging cells are not strong enough to penetrate human skin, making them safe to touch. In the wild, they live in temperate areas of the Indian, Atlantic, and Pacific Oceans. 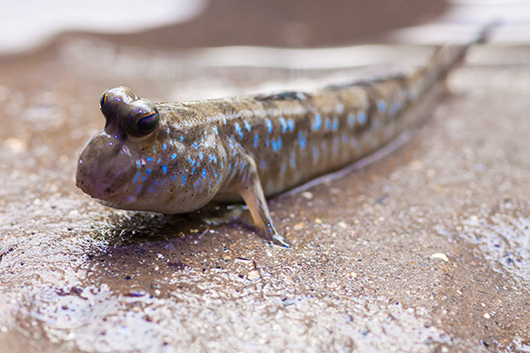 Mudskippers are unique fish that have adapted to an amphibious lifestyle and can live both underwater and on land. Native to Indonesia, Africa, and the Indian Ocean, mudskippers get their name from their ability to hop and climb using their pectoral fins.